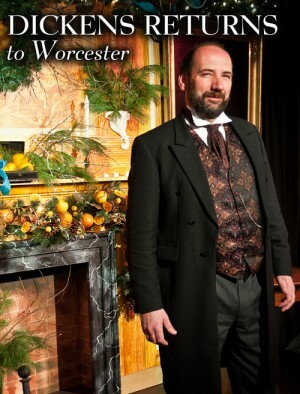 Gerald Charles Dickens Takes Stage at Vaillancourt Folk Art in a dazzling one man performance! 'A Child’s Journey with Dickens' — When Dickens returned to America in 1868 he was old, in poor health and in constant fear for his safety following a narrow escape in a rail disaster a few years earlier. At the heart of this show is a young girl’s memory of meeting the great man on a train journey in New England, and Dickens’s enchantment with both her boldness and innocence. An enchanting tale for all ages! 'The Life and Adventures of Nicholas Nickleby'— Inspired by the Royal Shakespeare Company’s 8-hour of Nicholas Nickleby, Gerald’s version packs the plot into just 1 hour. Travelling with Nicholas across the country we meet some of Charles Dickens’s greatest characters. Nicholas Nickleby shows Charles Dickens off to his theatrical best.